Home|Floral Library|Wax Vine – Hoya spp. Wax Vine – Hoya spp. Decorative Life: Months to years, depending on use. Member of the Asclepiadaceae (milkweed family). Native from Asia to Australia. A few common relatives are milkweed, wax-plant and stephanotis. Flowers are in rounded, tight clusters at ends of stems. Leaves are oval, often thick and leathery, 2-4 inches long with both variegated and non-variegated forms, stem vining. 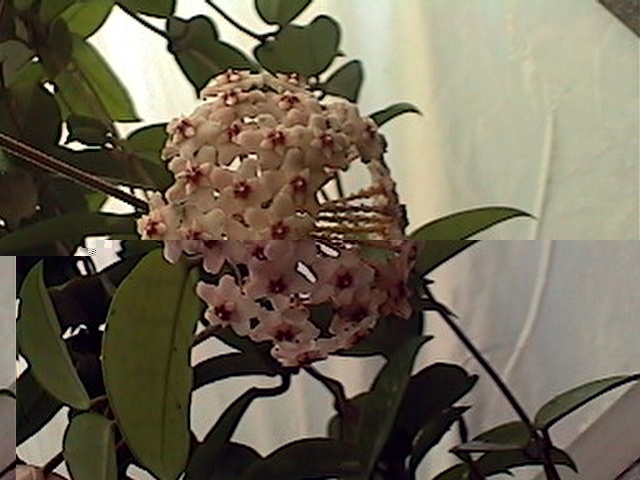 Hoya named for Thomas Hoy, a gardener to the Duke of Northcumberland at the end of the 1700s. H. carnosa produces flower fragrances only at night controlled by an internal circadian rhythm. Do not remove flowers once they have died as new flowers develop from the same spur. Will generally grow well in light levels bright enough to read a newspaper in comfort. If possible, move outdoors in the summer. This species is very durable and essentially pest free except for scale that can be removed physically with moist cotton.